At the age of 15 I had the wonderful opportunity to work with International Master, and world renowned chess trainer, Mark Dvoretsky. He visited Arizona, courtesy of the sponsorship of my father and grandfather, to work with a group of me and my peers (in rating, not in age -- which meant we had a room of roughly 8-10 2200-2350 players). While in the desert, Mark first introduced the 15-Minute Drill to me for the first time. When I later traveled to Moscow the following summer (16 years old then), Mark continued to use this training method to challenge me on a number of levels. The exercise works the practical, psychological, "time-management", and of course "X's and O's" muscles of chess. Though I don't know for sure if Mark invented this drill himself, he gets full credit in my mind! I later learned that even GM's such as the likes of Shirov have used this training method when preparing for big events. Since returning from my "Summer of Chess Love" in Moskva , I have used this exercise for myself and when training my students. Here I plan to layout the format of the exercise for you, provide enough material for up to 5 Drills (25 puzzles for players rated between 1400-2000, roughly), suggest some ways of "raising the stakes" for yourself when training, and finally, release you into the wild! Get a chess board (yes, you MUST complete this exercise with an ACTUAL chess board in order for you to really create the necessary "vibe" for success. If you don't have one, buy this one! ), clear the board, and setup the first position. Set the clock for 15 minutes (the other side/opponent's time is not relevant). Start the clock, and start solving the first position. The goal is to solve 5 problems within that 15 minutes. Every time you miss a problem, you subtract 5 minutes from your remaining time, in addition to any time you used attempting to solve the puzzle. Doing the math, you will obviously need to solve a minimum of 3 out of 5 correctly, BUT the point of this exercise is much more of a race against time, learning how to manage time, keep yourself focused, and understand that you don't have to solve every position correctly in order to "defeat the Drill" (or win a chess game for that matter). If you solve the first three puzzles and have more than 10 minutes remaining, you have beaten the drill and the remaining two puzzles should "carry over" to the next round before you solve them. Likewise, if you have more than five minutes remaining heading into your final puzzle, the last problem is unnecessary and should carry over. The goal, again, is to beat the clock, NOT every position. If you attempt the exercise and are not honest with yourself about whether or not you solved the puzzle correctly, then you are a horrible person !!! 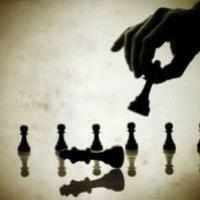 OK, not really , but the point is that you should always be getting the first move right (without exception) and generally, the first 3 moves, plus the MAIN idea should be correct if you think you got it right. Do I really need to tell you not to look at the answers? Let's try one! If you spend five minutes on a position, and get it wrong anyway (cutting your time down to less than five minutes for the remaining four problems), you're in big trouble, right? On the other hand, sometimes you can smell blood and you know you are close. Here you need to finish them off in a hurry so that you don't waste any more of your time for the future puzzles, right? You get it? It challenges so many real, "over the board", critical thinking skills a chess player must have. This exercise takes intuition, focus, and an "unbiased" sense of whether or not you are on the right track. Like a real game, sometimes you just have to make your best guess based on what you think is going on, and wait for a more critical moment to invest your time. Other times, you really need to bring it and focus! All these practical and psychological elements come into play during this exercise, and unless the positions are way too easy, or way to hard, you should be getting close (meaning you don't lose on time or beat the drill until your 4th or 5th puzzle). You may also notice one thing about to the first set of positions I provided (as well as all future 15-Minute Drills I will ever lay out for a student of my own): Every position is different! This is not like solving a bunch of positions where you know the tactical theme ahead of time, or you know you are always trying to win material, or checkmate the opponent, or even draw for that matter. Each one is from a real game (nothing made up) and each position is challenging in its own way. And no -- as I have told countless students -- I am not going to tell you what you are playing for! JUST like a REAL game!!! Who's excited about this?!?! Now, without being your personal chess coach, it is impossible for me to tell (obviously) how you are doing on a given set of positions. Generally, if I find a student whizzing through the exercise, or struggling mightily, I will adjust the level of positions accordingly. It is definitely a difficult thing to "self-regulate" this process, but it can be done (as I do it for myself). The only way to do this is to be completely honest with yourself on how easy or hard the positions are from the given book, article, etc you are using for your puzzles. If it isn't working, find a more suitable book, article, etc to replace it with. There are many great puzzle books out there, but for players of this level (1400-2000), I believe Lev Alburt's Chess Training Pocket Book should do the trick (as several of the positions used here are from his selection). I have used John Nunn's Puzzle Book for myself more recently (extremely difficult read) and Volokitin's Perfect Your Chess as well. The key here is not to use a "300 Pins and Forks" or "100 ways to checkmate in 3 moves" book... as those would obviously defeat the purpose. One more thing: If you want to increase the level of intensity in your own studies, find a way to "put something on the line". Before tournaments I would often put 50 push ups "on the line" for a failed 15-Minute Drill (and yes, I can do 50 push ups... come on people ) in order to get my blood flowing. I've heard that Shirov did something similar. If you are someone who doesn't get enough exercise, try that. OK, here is four more drills. Don't just solve them now. Save this article for when you are really ready to do this thing, and then make it happen captain!!! good luck and enjoy!